The folks at Adobe Stock have been monitoring the trends in the global use of images and have shared some insights into what to expect for 2018. (July 6th, 2017, Jerusalem, Israel) – Lightricks, the leading developers of premium image processing software for mobile, announced today the launch of Enlight Photofox, the next generation of the lauded iOS photo editing app Enlight. Recently awarded the prestigious Apple Design Award at the 2017 WWDC and Apple’s App of the Year for 2015 in numerous countries, Photofox introduces a new layers system that pushes the boundaries of artistic photo manipulation and redefines expectations from mobile creativity tools. Photofox brings new tools and enhances previously loved features with a layer-centric flow that gives immense power to aspiring creatives on the go. The latest app from Lightricks – also the developer of Facetune and Facetune 2 – strikes a balance between powerful functionality and streamlined design, creating a seamless user experience within the world’s most advanced mobile creativity software. The new application has been tailored to captivate today’s growing mobile creative community, empowering them with the tools to generate amazing visual art. Layers – Photofox’s Layers allow the user to combine as many photos as they want, blending and merging them seamlessly and easily. With this multi-layer functionality, as powerful as that of desktop software, users now have the ability to edit individual layers on mobile, offering even more precision and control and enabling more creativity than ever before from the palm of their hand. Quantity of Content – Photofox comes jammed packed with a huge variety of content: fonts, graphic elements, presets and more, to infuse new artistic elements into images. Enlight Photofox is available for free on the App Store. Users can opt to subscribe monthly or yearly to enjoy added features, content, and services. Lightricks was founded in 2013 by five entrepreneurs from the Hebrew University of Jerusalem, four of them CS PhD students, to create the leading creativity tools company for the mobile era. The company’s first two paid products, Facetune and Enlight, are two of the world’s most successful premium creativity apps, with over 11 million paid units sold. Enlight is the most powerful suite of image processing tools on mobile. It was Apple’s App of the Year for 2015, the #11 best-selling Paid iOS app in 2016, and was recently announced as the recipient of Apple’s prestigious Apple Design Awards of 2017. Facetune is a fun and powerful portrait retouching application, enabling regular users to achieve results previously reserved for professionals. It was Apple’s #4 best-selling Paid app in 2016. Each of Lightricks’ apps has reached the #1 rank in the overall Paid iOS charts of over 120 countries. Before raising $10 million in its first equity financing round in August 2015, Lightricks was 100% bootstrapped generating $10 million in revenues a year. In addition to leadership in its core imaging technology, the company builds proprietary user acquisition systems through access to controlled APIs, and serves as Facebook’s case study for user acquisition. In November 2016 Lightricks began pioneering subscription business models for mobile tools with Facetune 2 – following recent, major iOS platform policy announcements in which the company participated. reality by making advanced photo-editing on iOS simpler and richer than ever before. Building off Apple’s new subscription model, Enlight Photofox perfectly blends today’s photo-editing needs with tomorrow’s most advanced technology. The new multi-layer functionality allows users to pilot their adjustments with exact, unprecedented control. Enlight Photofox comes jammed packed with four times the amount of content, equipping users with a huge selection of fonts, presets, brushes, effects and more to infuse new artistic elements into their images and create beautiful, digital art. PRO: In addition to the free features, users can subscribe to get all access to the apps’ features, layers, and packs. New features will continuously be released for subscribers. 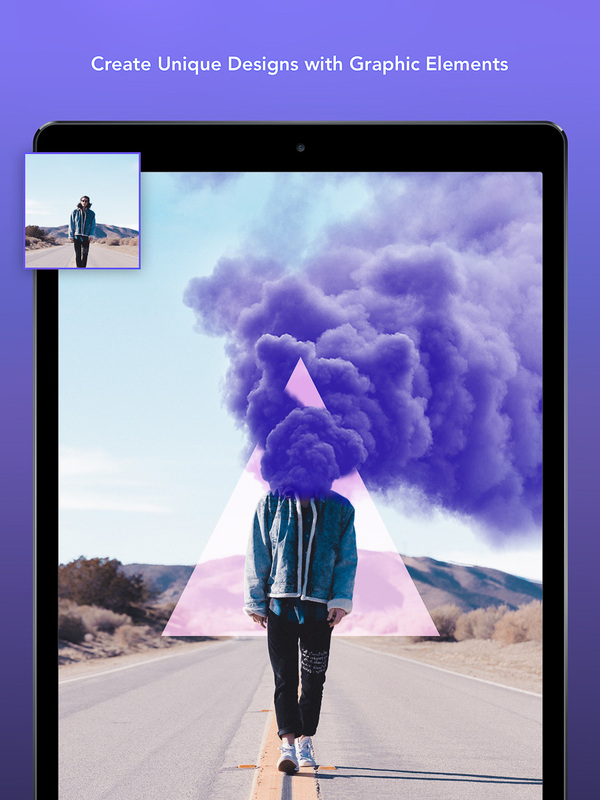 Layers – Enlight Photofox’s Layers allows the user to combine as many photos as they want, blending and merging them seamlessly and easily. With this multi-layer functionality as powerful as that of desktop software, users now have the ability to edit individual layers on mobile, offering even more precision and control and enabling more creativity than ever before from the palm of their hand. Quantity of Content – Enlight Photofox comes jammed packed with a huge variety of content: fonts, graphic elements, presets and more, to infuse new artistic elements into their images. Layers – Users can add and manipulate multiple layers with full control. For a seamless and fully customizable editing experience, users can continuously switch back and forth between layers, without locking in edits. Each layer can be edited separately or merged, empowering users with Desktop-like creative control. Tone – The Tone category offers unique image enhancements empowering users with artistic control, duo-tone filters and an extensive array of adjustment options for tuning contrast, structure, brightness, saturation, hue and more. Adjust: Simple, detailed control over tonality and details for quick color correction. Tools – The Tools category gives users an array of tools for both artistic and essential image enhancements. Type: Overlay a wide array of fonts and texts onto images with full artistic control. Artistic – Powered by AI, the Artistic category enables users to create art with their images with just a tap or swipe. Effects: Use a unique array of effect brushes to any image for added flair and design. *PRO – With a subscription, users will enjoy tons of added asset packs to spark creativity. Photolemur for Mac, the world’s first fully automatic photo enhancement solution has been launched. Designed for anyone who takes photos, Photolemur gives users the ability to rapidly process dozens of photos, giving great results on a whole range of images in minutes. Photolemur ensures that anyone who takes photos, but doesn’t want to waste hours editing them, no longer needs to. Using groundbreaking technology and AI, Photolemur delivers natural image enhancements automatically and then uses Artificial Intelligence to learn the enhancements that you like or dislike to improve in the future. Photolemur doesn’t have any hard coded filters, rather, it applies specific enhancements to each image. Powered by new technology which recognizes objects, faces, trees, sky, foliage and more, Photolemur differentiates between portraits, landscapes and macro photographs and applies the right enhancements for those images. There is almost no human involvement. Just load your images and let Photolemur do the work for you. Everyone wants great photos. Whether they’ve been taken on cameras or on their smartphones, those images are memories and snapshots of special moments. But photo editing is a time intensive task and most people simply don’t get round to it. Millions of great photos never get shared or even looked at again. Non use of photos can be because the idea of editing outs people off, or because when they look back at an image the shot doesn’t capture the scene as vividly as they remembered. The details that make an image great are often missing. Photolemur is the fastest way for you to enhance any photo. It brings natural, vivid looks to photos, just the way we see with our eyes, and the way we remember a scene. Photolemur doesn’t change the image or bring in effects, it reveals the hidden details that made the image great in the first place. Unlike photo editing tools, Photolemur does everything by itself, removing the need for manual control and heavy human involvement. However Photolemur doesn’t use preset settings to make changes, it uses previous experience to identify borders, objects, sky, foliage and more, and makes the necessary adjustments to the image. Once Photolemur has done its work, you can share your images immediately to social media. This simple process means more great images and memories can be shared. Photolemur is designed to have the least human involvement possible. Behind the scenes, Photolemur analyses millions of pixels per second, identifying individual features such as trees, faces, foliage etc. and automatically makes enhancements which make your image stunning. As you bring in more images, every saved or shared photo builds a database of successful enhancements, and every non-saved image goes into an unsuccessful database. This ensures that all future enhancements are built on a record of success. Photolemur is constantly learning what you like and don’t like. For the user, it’s simple. Open an image in Photolemur, or drag an image into the application from anywhere on your Mac. Photolemur will make its enhancements and from there you can crop your image as you need to, and then save it or automatically share to social media. Exposure Compensation automatically detects and compensates for inaccurate exposure settings that may have affected your photos, making dark images brighter and vice versa. Foliage Enhancement automatically picks out individual trees, leaves and any other kind of plant or shrub and adjusts colors, sharpness and other features to bring the beauty back to your image. Noise Reduction automatically finds and removes unwanted digital noise that is most often created by slow shutter speeds in low light situations. Horizon Straightening automatically analyzes and adjusts for any slightly crooked horizons or backgrounds. Photolemur easily aligns that perfect sunset. Photolemur for mac is launching December 17th, with pre-orders starting now. A Windows version will be available in early 2017. Mobile, online and corporate versions of Photolemur are being developed for launch during 2017. Bestselling professional picture editing app Affinity Photo is now available to buy for Windows – and boasts a huge update for Mac, too. Ashley Hewson, Managing Director of Affinity developer Serif, says: “There are two genuine reasons to celebrate today for professionals who want a powerful, high-end image editor. “The launch of Affinity Photo for Windows means we’ve fulfilled our ambition to become a truly cross-platform presence, which was one of the core targets for us when we started developing Affinity apps over seven years ago. “Almost all our back-end code was designed to work regardless of the operating system, which delivers 100% perfect file compatibility between the two platforms. 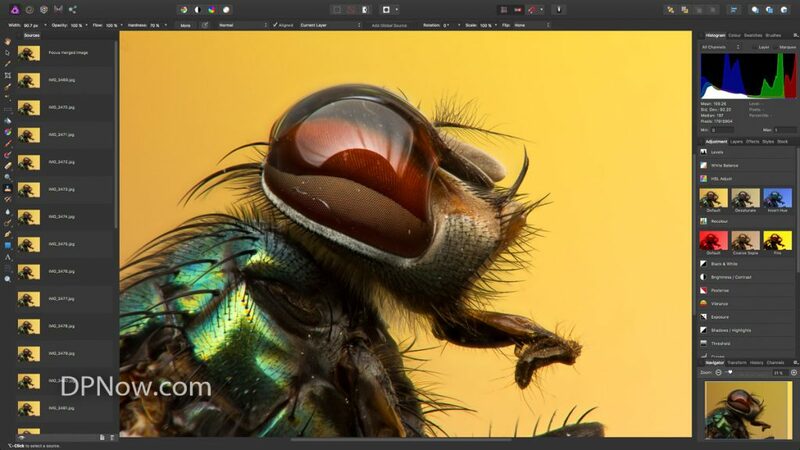 Affinity Photo is the second in a new trio of applications from Serif. Affinity Designer, a high-end vector graphics tool, is already available for both Mac and Windows. A layout tool, Affinity Publisher, is due to complete the suite in 2017. Affinity apps share the same file format on all platforms, allowing users to switch seamlessly between them both as individuals and in a professional environment, where colleagues work on different systems. The update also introduces support for the Touch Bar on the new Apple MacBook Pro. The usual price will be $49.99 / £39.99 / €49.99 for the software with updates included – there’s no ongoing subscription. For more information about Affinity Photo 1.5 and to buy, go to: https://affinity.serif.com/photo/new-features. Pan and zoom around 360 images, using the full suite of tools in Affinity Photo to edit them live. Greatly improved support for plugins meaning most third party plugins now work correctly. Including various styles and effects utilising the powerful new macro feature. Available with orders within two weeks of launch. Built from the ground up with a meticulous focus on workflow and blazing performance, Affinity apps are the culmination of Serif’s expertise and over 25 years’ experience in developing creative software. Like nothing that’s come before, Affinity apps are engineered to be the smoothest, fastest, most precise, and most integrated creative apps available. And Affinity don’t do subscriptions. Founded in 1987, Serif (Europe) Ltd has been repeatedly praised for its powerful software which has put professional effects and demanding publishing tasks within the reach of ordinary PC users around the world. Now the winner of over 200 awards internationally, with more than 6.5 million customers worldwide, Serif has more than 150 employees at its head office, development and European sales centre in Nottingham, UK. (November 25th, 2016, Jerusalem, Israel) – Lightricks, the leading developer of premium image processing software for mobile and the developers of hugely popular photo-editing apps Facetune and Enlight, are announcing the launch of Facetune 2.0. Following the success of Facetune which earned Apple’s Best of 2013 and became the #6 and #5 overall Best Selling Paid iOS App of 2014 and 2015 respectively, Lightricks has now launched Facetune 2.0. This release includes upgraded versions of existing tools and a host of new features powered by unprecedented image-processing technology. The release of Facetune 2.0, available on a freemium model combining in app purchases and subscriptions, signals the business model transitions beginning to trend in the mobile software industry. Lightricks’ unique formula of easy functionality and powerful editing capabilities have driven Facetune’s rise in a highly competitive mobile photo editing market. Photos have become a core part of the consumer experience on mobile, and Facetune 2.0 was developed to meet the demands of a consumer population with constantly expanding expectations of functionality and the highest quality mobile experience. Facetune 2.0 is powered by the most advanced image-processing technology available, bringing high fidelity 3D facial modelling to mobile for the first time. In addition, the app includes several features powered by artificial intelligence and augmented reality technologies, enabling effective live augmentation of photos, all of which provide consumers professional grade tools in the palm of their hands. 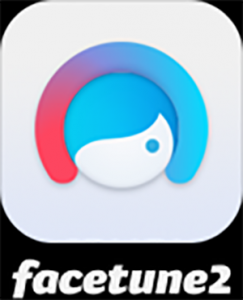 Face: This feature enables users to reshape specific facial features, using AI to understand how the feature should be manipulated to naturally fit with the rest of the face for true 3D reshaping. As an example, when snapped in a picture without smiling, users can use the Reshape feature to adjust the face to create a natural looking smile. Live Preview: For the first time ever, users can live preview adjustable effects before they snap the picture when using the front-facing camera. This AR feature superimposes facial modifications live in a real-time preview and allows users to experiment with edits such as smoothing skin, whitening teeth, enhancing details, modifying the shape and size of the eyes and nose, anti-glare and fixing shadows. Relight: By utilizing AI to strip original illumination and simulate new lighting, Relight enables users to control lighting with the swipe of a finger when taking a photo in any environment, similar to the way conditions are controlled in a live studio. “Consumers’ relationship with mobile apps has come a long way since we launched Facetune, and it has been such a popular app that we wanted to deliver an even more magical experience,” Said Zeev Farbman, Co-Founder and CEO of Lightricks. “We’re working with the most advanced image-processing technology and delivering it to consumers in an incredibly simple and easy to use interface. The mobile software landscape needs to shift away from free or small one-time payment models in order for developers to support sustainable R&D at a scale that continually delivers the newest and highest-grade experience to users. We are hoping that Apple’s new subscription model is going to do just that – enable tool makers to thrive on iOS, fostering the same kind of category defining software companies built during the desktop era,” he added. Upgraded versions of all the original features of Facetune are available for free in Facetune 2.0. Facetune 2.0 includes an in-app store in which users can try and buy an extensive list of additional features, or can choose to subscribe on a monthly or yearly basis to gain full access to all existing and future features, content and services. Lightricks will continually update and release new features for subscribers. Lightricks is an Israeli startup founded by five entrepreneurs with a proven track record in both academia and industry, four of whom hail from backgrounds as computer science PhD students. Lightricks developed the LTEngine™, a state-of-the-art mobile image processing engine, and the SafeBrush™, a precision tool for the most accurate results. Building on this technology, Lightricks created the successful mobile app Facetune, a powerful and fun portrait photo editor that enables everyday users to easily achieve professional-level results, and Enlight, the most comprehensive photo editing tool for mobile. Facetune and Enlight have both been the #1 Photo & Video App in over 120 countries, and Facetune was selected for Apple’s Best of 2013, Google Play’s Best of 2014, was the #6 Best Selling Paid App for iOS in 2014, the #5 Best Selling Paid App for iOS in 2015, and is currently used as Facebook’s case study for user acquisition. Enlight was named the Runner-Up App of the Year in the US in 2015, and App of the Year in other major markets including Britain, Australia, Canada, Germany, China, and more. In August 2015, after being entirely self-funded for two years, Lightricks raised $10 million in its first external funding round, led by Carmel Ventures. Lightricks continues to deploy state-of-the-art technology to create the next generation of creativity tools for the mobile era. Workflow UX: Facetune 2.0 includes all the features of Facetune plus many new additions, with a more intuitive UX and a smoother, faster workflow. In Facetune 2.0, all features have a simple-to-use slider so that users can easily adjust the intensity of each edited manipulation, or paint over certain areas for easy customization. Users can take advantage of an AR auto-retouch feature or apply the wide array of tools and brushes to pilot full control over image appearance. All original features of Facetune are available for free, with an extensive array of new features in the Facetune 2.0 Store available for individual purchase. Alternatively, users can subscribe for full access to all new and future features. Face: This feature enables users to reshape specific facial features, using AI to understand how the feature should be manipulated to naturally fit with the rest of the face for true 3D reshaping. As an example, when caught in a picture without smiling, the Reshape feature can be used to adjust the face and create a natural looking smile. Retouch Brushes – A variety of brush features enabling users to easily apply manipulations onto specific image areas with a fingertip. Also includes original special effects which can be applied to bring more artistic touches to photos. Conceal: With this feature the user can swiftly swipe to remove dark circles and bags under the eyes. B&W: Edit images into black and white for a cool effect. Cool Down: Desaturate overly red skin and cool down the skin tone by swiping over specific areas. Heal: A feature that enables users to swipe over blemishes and wrinkles with unique content-aware technology which acts as an automated skin graft, blending in with the skin tone so as to appear more natural. Matte: By swiping over any areas with unwanted shine, this feature reduces the look of sweaty or oily skin. Cleanse: Clean up skin to minimize pores and unwanted blackheads for a clearer and more refreshed face. Smoother & Texture: The Smoother brush allows users to easily swipe across the image to smooth out complexion. The Texturizer tool adds texture to the smoothed area, enabling a realistic and natural look. Glow: Gives skin a flattering yet natural glow to rejuvenate dull skin tones and color. Vibrance: Utilizes the slider tool to revitalize photos by increasing or decreasing vibrancy of pale skin for a more radiant complexion. Fix Tone: Slider enables user to easily tweak and tint skin tones. Sharpen: Allows users to sharpen features and intensify colors. Fix Shadow: Enables user to swipe over underexposed areas to remove unwanted shadows. Anti-Glare: User can swipe overexposed areas of the image to remove any unwanted glare. Structure: Enables user to swipe over features such as eyelashes and eyebrows to bring out the details of the face. Tools – A variety of new and improved tools to provide customized control over shaping, lighting, focusing, and touch ups, dedicated for fine-tuning specific areas of images. Reshape: Using their finger, this tool enables users to gently enlarge or minimize eyes, nose, or mouth to refine specific facial characteristics and account for poor angles and lighting. Light FX: Allows the user to add lighting effects to bring a unique, creative flare to each photo. Face: An AI component, this feature was introduced to easily enlarge or minimize specific features of the face, including the shape of the face, eyes, nose, and lips for true 3D reshaping. Using a data driven approach, this feature enables users to reshape specific facial elements, utilizing AI to understand how the feature should be manipulated to naturally fit with the rest of the face. As an example, when caught in a picture without smiling, users can use the Face feature to adjust the face to create a natural looking smile. Relight: By utilizing AI to strip the initial illumination and simulate new lighting, users can control lighting when taking a photo in any environment, similar to the way conditions are controlled in a live studio. Vignette: Allows users to add and adjust the vignette with full control. 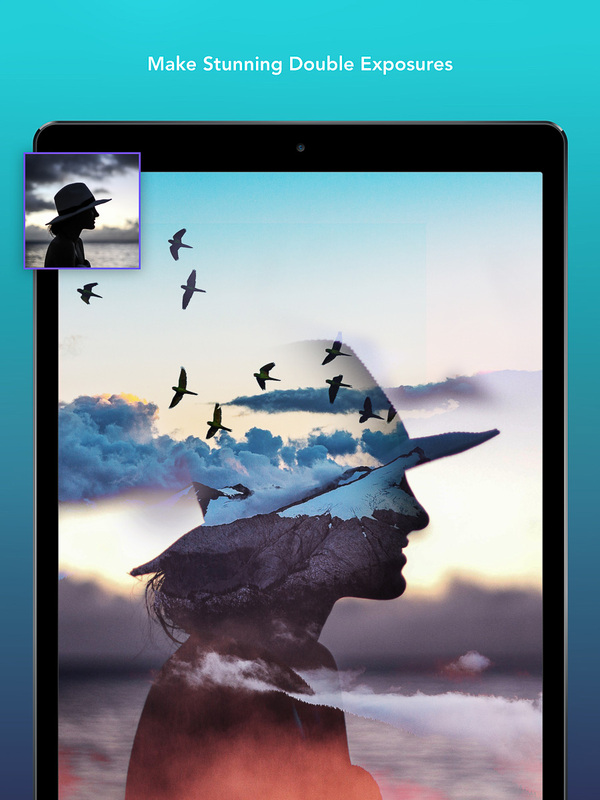 Backdrop: Enables users to easily delete and replace the background of their photo. Prism: By adjusting the intensity, users can take advantage of prism light effect, creating a unique fractal appearance. Patch: Copy and paste one area over the other to seamlessly hide blemishes and other unwanted marks. Darkroom: For advanced color modifications, users can make tonal adjustments for a color-correct photo, giving ultimate control over brightness, temperature, saturation, contrast, vibrancy, and more. Eyes: Allows users to enhance the appearance of their eyes with details, reflection, pupil size, color, and more. Filters – Built with a new range of over 20 preset filters for mobile so that users can become trendsetters and create and save their own customized filters. In-App Camera – Facetune 2.0 includes a native camera feature. Users can adjust the elements of the image in real-time, enabling them to preview the effects and enhance the editing experience. Store – Users can buy any feature individually, or can subscribe for full access. Users can test every feature in the store before buying. New features will continuously be released for subscribers.